Cliftonville retained the Irish League title for the first time in their history as Chris Curran and Stephen Garrett goals saw them beat Portadown. Curran fired a low right-foot shot into the bottom corner in the 53rd minute, while Stephen Garrett headed in a Martin Murray cross for 2-0 after 85. 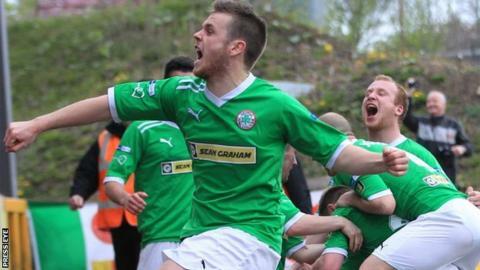 Championship rivals Linfield went down 2-0 to Glentoran at Windsor Park. The Reds had ground to make up after an under-par start to the season but their form in recent months proved decisive. Cliftonville enjoy an unassailable six-point lead over the Blues with only Saturday's set of fixtures remaining. "We won 10 and drew one of our last 11 games. We worked hard since Christmas to cut a big deficit and I have great admiration for the players - they deserve every credit," said Reds manager Tommy Breslin. "It feels great - I was always confident we would win it and it is even better than last year. "It's a squad game and everyone has contributed and put a shift in. I'm delighted for everyone involved with the club. "Good teams win the league once, great teams go on to win it again." Portadown went into the game in the knowledge that they were the only team the champions had failed to beat so far this season and Ronnie McFall's troops enjoyed the better of the first half. David Miskelly saved well from Joe Gormley early on while, for Portadown, Sean Mackle side-footed a volley over the bar from a Gary Breen flick-on. Gary Twigg then had a headed chance but defender Ronan Scannell did enough to put him off and prevent a certain goal. Liam Boyce struggled with an ankle injury for much of the first half but still emerged for the second period at Shamrock Park, before being substituted late on. The Solitude outfit lifted their game and Curran broke the deadlock after good work by George McMullan. Marc Smyth could have extended his side's lead but headed off-target when well placed, then Conor Devlin pushed a Darren Murray strike round the post. Ports defender Chris Casement saw his free-kick cannon off the woodwork, before Garrett managed to get on the end of Murray's delivery across the face of goal. Cliftonville will be presented with the Gibson Cup after their final league game of the season against north Belfast rivals Crusaders on Saturday.